The gallery combines a mixture of classic and new work, including an image designed especially for Brighton reflecting the city's vibrancy and heritage. 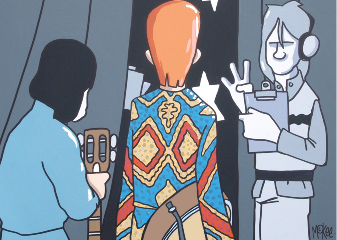 Pete McKee is an internationally-renowned artist whose inimitable style and sense of humour has earned him fans the world over, working with some of the biggest names in music and fashion. The pop-up galleries are an opportunity to see a selection of Pete's work, selected for these events, showcasing the diversity of his witty and charming images. "Anyone who has flirted with the concept of modernism as I did as a teenager in the late 70s, can't help but fall in love with Brighton and the role it played in our cultural imagination. "When you walk down the sea front you get a sense of the history that it holds and its representation in cult films like Quadrophenia. Brighton is home to some amazing artists and art institutions too so I can't wait to bring my work there." The tour coincides with the release of Pete's new book, Council Skies, a collection of his work over the last 15 years, from his early sketch work right through to images from his most recent exhibitions. It features a foreword from award-winning social affairs writer and author of Austerity Bites: A journey to the sharp end of cuts in the UK, Mary O'Hara, and an introduction from Dr Susan McPherson, lecturer in Sociology at Sheffield Hallam University. The book will be released on June 14th, available to buy across all McKee platforms including the first pop-up shop in Brighton. Pete will do an in-store signing at the Brighton pop-up from 4pm - 6pm Saturday 15th June 2019. It is the first stop on a tour which also visits Birmingham (4-7 July) and Nottingham (24-27 July). Pete McKee exhibition at ONCA, 14 St George's Pl, Brighton from Friday 14th - Tuesday 18th June 10am - 6pm. Free Entry. For more info CLICK HERE.